Have you noticed the development at 5350 Burnet? It just keeps on growing, this time with the addition of a new sushi place. Roll On Sushi Diner opened in August and has brought its unique take on sushi fusion to our neighborhood. 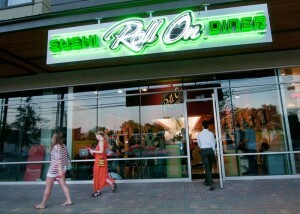 One of the first things you’ll notice upon visiting Roll On Sushi Diner is, well, the “diner” part. Instead of tables, there’s a shiny red lunch counter that wraps around the interior. The barstool seating lends itself to interaction with neighbors, as well as being able to watch the chefs at work. I’ve eaten there twice, and both times I was impressed by the friendliness of the staff and their willingness to answer my food-related questions. The environment is cool, clean, and Austin-chic. Bright art pops from the walls, and a steady stream of cool tunes, including those from local faves Bob Schneider and Sarah Jarosz, streamed steadily from the speakers. It’s one thing to have a cool vibe, but what about the food? I can attest that the food at Roll On Sushi is yummy, fresh, and satisfying. Lubbock natives and brothers Chip and Chad Reed have taken traditional Japanese sushi and kicked it up a few notches by offering sushi rolls in a unique fusion style. Head Chef Ben Crockett, who created the menu with the Reed brothers, is a traditional sushi chef who seems willing to push the boundaries of what people might consider sushi to be. Roll On’s pricing is also unique: each dish on the regular menu, including appetizers, rolls, salads, bowls, and desserts, ranges in price from $3.95 to $6.95 per plate. Even better, for the numbers-challenged like me, each price corresponds to a color (for example, all $3.95 dishes are served on white plates, $6.95 dishes on red plates, and so on). Chip tells me, “We want our menu to be very accessible, and we want people to feel comfortable.” To that end, they have included heavily Austin-influenced on the menu, such as the Hippie (tofu, cucumber, red pepper, panang curry, rice, nori, and mint) and the Cholesta Roll (say it fast a few times and you’ll get it), which consists of mashed potatoes, grilled steak, and green beans all rolled up and deep-fried. It’s then sliced and served with cream gravy. Traditional sushi aficionados, fear not. “While we focus on fusion, we do traditional really well,” says Chip. Roll On Sushi features nigiri, salmon, and yellowtail on a regular basis alongside more, um, “non-traditional” eats like the Elvis (peanut butter, bacon, and banana roll with mayo or chocolate sauce) and the Rolltalian Stallion (tomato, basil, and mozzarella roll with olive oil and balsamic reduction). On a lunch date with my husband, I thought it prudent to try as many things as possible. We shared several rolls, along with an appetizer of freshly steamed edamame ($3.95). My favorite roll that day was the Spicy Tuna Crunch Roll ($4.95): tempura fried tuna, rice, and nori served with spicy mayo. It was fresh, appropriately spicy, and crunchy. I am not an avocado fan, but Nathan enjoyed the Guaca-Rolly ($6.95), featuring spicy tuna and tempura shrimp with avocado and spicy mayo. We both liked the Dyno-Mite roll ($3.95), made up of tempura shrimp, rice, nori, and spicy mayo. Some time when we have an evening date (what’s that again? 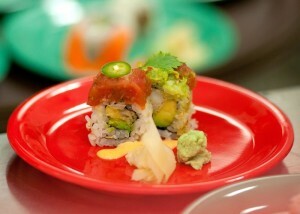 ), we’ll partake of Roll On Sushi’s selection of adult beverages, which includes wine, sake and beer. We might even go there on foot. One of the best things about having a fun new restaurant in our neighborhood is just that: it’s in the ‘hood and easy to walk or bike to. In fact, Chip said he estimates that 75 percent of his neighborhood clientele either walk or bike to the restaurant. It helps that Roll On Sushi is on “our” side of Burnet; sometimes crossing Burnet on foot or bike can be tricky. Head on over to 5350 Burnet and check out Roll On Sushi, even if you’re not a “sushi person.” You’ll be warmly welcomed and find something unique. Open for lunch Monday through Saturday from 11 a.m. to 2:30 p.m.
Open for dinner Monday through Thursday from 5 p.m. to 9 p.m.; Friday and Saturday from 5 p.m. to 10 p.m.
My name is Chad Reed and my brother and I own Roll On Sushi Diner. We want to thank you for the great write up and we are very happy to be a part of the community! We love to support local schools and events so feel free to reach out to us any time! We look forward to seeing you all at Roll On soon!